What size pendant light did you choose. There are 3 sizes available at Restoration Hardware. Thanks. - Also, what is the length of your kitchen island. Thank you. Would you please tell me the distance between these pendants from centre to centre? Hi Linda. Such a beautifully designed kitchen! We have a 120" length island with a 54" depth and are considering 13.75" diameter pendants within our 10 ft ceiling space. Would 36" spacing between each center point of the pendants work or would you go up in distance? Also, do you recall how low from the ceiling these pendants hung? Thank you! Finishes? - What finish was used for the faucet and cabinet hardware? Hi Linda. 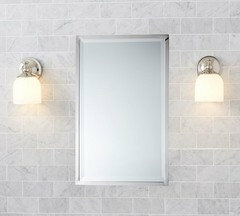 We have been debating if we can go with the Restoration Hardware Benson pendant in polished nickel if we have polished chrome faucets and cabinet hardware. If I am reading this thread correctly, you did exactly that in this photo, is that correct? I hope so, because this kitchen is beautiful and I would love to have a similar look. Thanks in advance for your insights! Yes. We often mix finishes and think well mixed finishes give the home a more interesting look. Good luck. Help - How many of the RH Harmon pendants would you use for an island that is 96" long. The Harmon pendants come in 11", 15" and 19". Thank you very much! Love your work! If I have a 6x4 feet island with 8 foot ceilings how many and what size Harmon lights would you use if they come in 11", 15" and 19" diameter? Island - What is length and width of island? I love the stools! I have been searching for dark wood stools with grey leather to compliment my new white and grey kitchen. Where can I get them? Jill, depending upon what you are looking for, we would be happy to help you find them. Please feel free to call our retail boutique manager (Wesley) at 864-233-6622. These stools are available for purchase through Postcard from Paris Home. Please contact us directly for additional information. These pulls and knobs are from Restoration Hardware. hey..Love the floor.What color is this and type of wood? The floors are 6” wide white oak in random lengths. It is a custom stain matched to a wood sample for a different application. You could probably get close to the color with a dark walnut stain. Can you tell me the cabinet and walls colors. Thank you. should i do same color continued from cabs is what i was asking or is ceiling typically lighter in most houses and trim color diff from kitchen cabs? spaul, I'm sure you figured it out and it turned out nicely! We are matching our trim to our cabinets throughout the house. Walls and ceilings will be different shades. Is the cabinet hardware polished nickel? Would polished chrome give the same effect given the nickel pendants? - I love the pendant lights, and have a similar kitchen, but we have polished chrome cabinet hardware. I'm not sure mixing those two finishes would flow or be so similar that it looks like a mistake. I have a medicine cabinet with a chrome frame. I cannot find a light of the same. Do you think it will look stupid, if I mix the chrome cabinet, with a polished nickel scone? I plan to have the light ontop of the cabinet, horizontally. Island and pendant dimensions - Hi Linda! I have been admiring your work and would very much appreciate your advice. For a 10 x 5 foot island what would your recommendation for pendant configuration be if the choice is between a 12 inch or 16.5 inch pendant? The room is very large with high ceilings. I am struggling with the size and number of pendants to use over the island. Thank you! What size is the island and pendants in the original picture. We have an 8x4 island and trying to decide how many of these restoration outlet pendants and what size 13 or 16". So sorry for our delayed response. The island countertop is 8'-3" x 5'-0" and the cabinet is 7'-4" x 3'-5". The pendants are 13." Ceiling height - Are these 10' ceilings? You can mix finishes. I would keep kitchen cabinet hardware and plumbing in Chrome. Depending on what type of lighting fixtures you use you can either do chrome or some type of dark finish. Just make sure that the ORB finish you use is not reddish brown but more of a dark charcoal. You can also consider using an antique nickel finish for some of your lighting. 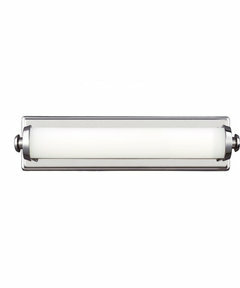 Again, depending on the fixture you use not all the lighting has to match. You just have to take into consideration the open spaces and the shape and type of fixtures you use. There is no perfect formula for it, you just have to try to visualize all the pieces in context. In the house shown, the kitchen lighting fixtures, plumbing, and hardware are all Chrome but the breakfast room lighting is an antique wood chandelier while the great room which also open on the kitchen has an iron and wood chandelier. The door hardware in this house is all brushed nickel but it could also be ORB with no problem. Most of the lighting throughout this home has some type of an antiqued finish. I think well mixed finishes give the home a more eclectic and interesting look. Thank you! You've really cleared up some of the confusion! Where is the cabinet hardware from? And what size are the pulls? Thanks! is the hardware polished nickel or brushed nickel? Thank you! Cabinet hardware is polished nickel. Faucet is polished chrome. Do you know the measurement of the center island? Thanks. Restoration Hardware or Pottery Barn would sell a very similar product. These particular pendants are from Restoration Hardware. Thank you. The floors in this kithen are beautiful!!! Can you tell me what kind of wood and the stain on them? - . thanks so much. It really it beautiful. I hope I can get something similar in our new home. Thank you and good luck! Let us know if we can assist you in any way. Love the clean lines and simple elegance of this Kitchen. Who makes the Bar Stools? The bar stools are manufactured by Lee Industries. What is hte sheen on the cabinets? Semi gloss? Is the wall paint ( specifically on soffit ) the same as cabinet color and sheen or is it different? Looks different and curios what you used there... A brighter white, perhaps? Love this kitchen!!! The soffitt is the same color as the walls: Benjamin Moore OC-21 Winter White/ Eggshell which is the same as the cabinets, just a different sheen. Drawer pulls - Can you tell me who makes the drawer pulls? Is there a "rule" to follow for wide drawers...how many pulls per drawer? How wide should the pulls be if doing one or two per drawer? Our kitchen drawers will be 29". Thank you!! Hi Linda, for kitchens with 10 foot ceilings.... - What do you recommend for kitchen cabinets re: height of uppers and crown/bulk heads...how do you keep costs reasonable and still nail the best look and feel? What are the size of the uppers in this kitchen? How tall are the glass cabinets and the upper cabinets to the far right (if looking at the hood)? Thank you. Love, love, love. What the the style for the 3-panel interior doors? - Hello, This home you designed is beautiful. I'm planning for 3-panel interior doors and really like the style of these. What is the sticking "design"? I have a variety of 6'8 doors and 8'0" doors. Would you recommend doing 3-panel for all the doors or doing 4-panel for the taller doors and 3-panel for the smaller? Thanks very much for your help!! Can you tell me the manufacturer and leather of the stools? The stools are from Lee Industries and are available through Postcard from Paris Home. Please contact us directly for additional information. Distance between the pendants - How far apart are the pendants from one another and from the edges of the island on each side? Hi Linda - I have been admiring your work and would very much appreciate your advise. For a 10 foot island what would be your recommendation for pendants if the choice is a 12 inch or 16.5 inch pendant? I'm struggling with the size and number of pendants to use. That you! Question about fnishes: - Love this kitchen! I have stainless appliances and brushed nickel hardware. I would like to go with a chrome faucet. What finish should I use for the pendants? What do you think about mixing the finishes? Thanks! Linda, I have all ORB doorknobs throughout my home and chrome cabinet hardware & faucets. Can I throw in antique bronze RH pendants in my kitchen with chrome faucet and cabinet pulls? (soapstone counters, white subway tile backsplash, white cabinets)? I loved the pop of gold, and would try to tie it in with gold curtain rods in the room next to it. Thank you so much! I think this would in part depend on other lighting fixtures in adjacent rooms that can be seen from the kitchen as well as cabinet and countertop colors. Good luck. What kind of wood is on the ceiling? Where can I get it? Thanks! What material is under the v-groove? Are the lighting pendants polished chrome or nickle? Thank you for your answer! When I went to the website they don't show polished chrome as an option! Can you buy them in the store? I apologize for the confusion. They are actually polished nickel. How tall and wide are the glass cabinets on the sides of the hood? Thanks! The glass cabinets are 18" wide. backsplash - What is the backsplash? The back splash is Florida Tile -- FTI50601W3X6 White -- 3x6. Backsplash - Hi Linda, did you also have a store on Main Street? I lived in Greenville years ago and your business name sounds familiar. Anyway, is that polished carrara marble counters? Wondering if that is also just plain white subway tile and if you know where the backsplash/tile was procured. I want those stools... couldn't find them on the website-how can I order them? Spacing - How much space is between the island & the stove? What are typical spacing requirements? We don't have these exact dimensions but the island countertop is 8'-3" x 5'-0" and the cabinet is 7'-4" x 3'-5". Overall kitchen size is 15’8” x 19’6”. Standard walkway around the island should be between 42-48 inches. How did you support the overhang on the island? I am looking to put in a 108x72 granite island (could be shrunk to 61"), but can't figure out how to support the center of the overhang. Lighting details... - Designing my home and using your work as inspiration! Just ordered 3 13" Benson pendants for 7'9"x5" island. Too many/right size? They come in 11" as well. The entire kitchen is 19'x17' with a recessed light above sink/open floor plan/moderate nat light... How many cans would you use to make the rest of the space work? What trim color/sheen in this scheme do you usually use? Thank you. I love all of your work. Inspiring! I appreciate your time and input... Thank you! What finish did you put on the faucet ? Is it polished chrome or polished nickel? - Love the kitchen!! Thank you. It is polished chrome. Where can I get those chairs??? Do these stools come in bar height ? who is the manufacturer of sink faucet? is it newport brass? style?i wish you lived in los angeles! Rohl Bridge Faucet (U.4719L) in Polished Chrome. Thank you. How wide is each inset glass cabinet above the stove? Thanks! Number of pendants - If our island is 6ftx4ft with 8 feet ceilings would you recommend 2 or 3 pendant lights? Beautiful. How much space? - What were the dimensions of this kitchen? Stools - Where did u get the counter stools? Previous comments show """The floors are 6” wide white oak in random lengths. It is a custom stain matched to a wood sample for a different application. You could probably get close to the color with a dark walnut stain.""" Can you please share the cabinet hardware? - Thanks!! Bars tools - Can you please share who makes them? Thanks! Are the doors MDF/wood? Height of doors with transoms? Love! I believe you are referring to the cabinets in this kitchen? These cabinet doors are wood. The cabinets with the mullions are 37 1/2" tall. Your kitchens are stunning! - Thank you for the tremendous feedback that you've provided through the Q & A! In this photo, are the cabinets to the right of the island standard cabinet depth (24"), and how is the living space on the other side of this counter used? Last question....are you available for phone consultations?! Thank you for your questions. These cabinets are the standard 24" cabinet dept and the living space on the other side of the counter is a breackfast area. As far as phone conversations, due to our current project load, it may be difficult for us to do this; however, feel free to email us at marketing@postcardfromparis.com with details of what you may be looking to do and we can respond directly to you with availability. These cabinets are Benjamin Moore OC-21 Winter White with a Semi-Gloss finish. Yes, lighting can be coordinated with other finishes like door hardware and plumbing. Good luck. Too many LOVES to mention. - Could you tell me who the builder is? We will be building in a couple years in the area. Thank you. Thank you. The builder is Gabriel Builders. Faucet - Can you share who makes the faucet and the accessories next to it? Thank you! Barstools - Where are the barstools/counter stools from? Kitchen dimensions - Could you tell me the dimensions of this kitchen? Thank you! The Lee stools are available through Postcard from Paris Home. Please contact us directly for additional information. Floor and ceiling running same way - It's a gentle flowing look to run floor and ceiling boards the same way. Running opposite adds more contrast. Would you also run an ipe deck the same way if viewable from the kitchen or would you contrast something? Yes, I would run the decking the same way. The island countertop is 8'-3" x 5'-0" and the cabinet is 7'-4" x 3'-5"
Help - What are the countertops? The countertops are Carrera Marble. What is the distance between the island and counter or fridge? - My kitchen measurements are 18'-6" wide with only a 6' island. Our clearance between the island and counter is 42 on one side and 40 on the other. Are your counters more shallow? It is 42” all the way around the island. Thermofoil - Are the cabinets thermofoil or wood? Thank you. Love those ceilings! - We are doing the same type of ceilings in our cottage. What sheen/finish did you use? Semi gloss, satin? Thanks! Benjamin Moore OC-21 Winter White/ Flat. Thank you. Size of Pendants - Hi can you tell me what the diameter of these pendants are? 13 inch or the 16 inch Bensen? I am doing an island that's about 4x8 and can't decide whether to the get the medium or large ones. Thanks! We used the 13" pendants. Thank you. what is the finish on that faucet? - chrome, nickel, etc. where did you buy the island chairs? They are made by Lee Industries and can be purchased through Postcard from Paris. Are the countertops granite and if so what color? The countertops in this kitchen are Carrera Marble. How tall are the upper cabinets? And the ceiling is 10'? What are the dimensions of the island sink? My island is 7 ft long by 4.5 feet wide. What size pendants/how many? - My island is 7 feet long by 4.5 wide. I like two different pendants. 6” wide and 12” wide. My ceiling is vaulted. The peak is 21 feet high. Could I do 3 pendants 12” wide or is that too much? Pendant lights - I have a 6x4 foot island with 8 feet ceilings. How many and what size Harmons would you use? They come in 11", 15", and 19". Do they come with appropriate size drop down rods for my low ceiling? also, I have polished chrome Koehler faucet on the island and Harmon only makes a polished nickel. Will that be ok or will it clash? Pendant lights - Love the RH lights! We have a 6x4 island with 8 foot ceilings. We are thinking of using the Harmon lights. Would you use 2 or 3 and what size would you use, 11", 15" or 19"? Do the lights come with appropriate size downrods for my low ceilings? The island also has a polished chrome Koehler faucet and Harmon only makes polished nickel. Will that still be ok or will it clash? Thanks for the help! Pendant size and number - I have a 6x4 ft island with 8 feet ceilings. I am thinking of using the Harmon RH pendant lights and they are a little bit shorter but only come in 11", 15" and 19" sizes. How many of these pendants and what size would you use over the island? My faucet on the island is a polished chrome as well. Is the polished nickel similar enough to the chrome or will it clash? Thanks! Love everything about this kitchen! - Outstanding work! Would you mind sharing the diameter of the cabinet knobs that were used, please? Thank you! Is that a custom built hood with recirc. fan or fully vented hood? What size are the cabinets on either side of hood? What size is range? Island dimensions - Beautiful island! Do you know the approx dimensions of this island? Where can I find these counter stools? Cabinet Knobs - Who is the manufacture for the cabinet pulls? Great job! Can you please tell me the size of the Benson pendants? Thx - I am considering Benson pendants for our kitchen, but want to get the right size for the dimensions of the island. Are these the 13" or 16" pendants from RH? Thank you! Counter stools? - Who makes the counter stools? overhead lighting - Is there any overhead lighting in this kitchen in addition to the pendants? ceiling paint color - Beautiful kitchen! Is the ceiling painted a gray color or is it the same color as the cabinets? May be the lighting but hard to tell. Thank you! Is the ceiling headboard or tongue and groove and what is the width? Size of pendant lights and island - What size are the pendant lights? And what size is the island? Hood Dimentions - Can you please tell me how wide the range hood is (e.g. 30 or 36 inches)? I'd love to put one over our 30 inch range but our cabinet supplier said the range needs to be wider than 30 inches. Thanks! Cabinet color - It appears that the cabinets are the same color as the trim/doors...do you happen to remember which color was used? Thank you! Island size - What are the dimensions on this island? Cabinet height and color - Beautiful kitchen, could you please tell me the height of the upper wall cabinets and trim, color of white cabinets too? Please let me know how much space you think is between the pendants. - Please let me know how much space you think is between the pendants. This looks perfect. Is it about 20" between each one? I'm not referring to the holes in the ceiling but to the fixtures themselves on the bottom. Thank you! Beautifil Kitchen - Can you tell me the size of the island and how far apart you hung the pendant lights.. Thank you so much. Love the back splash! Is it installed centred or off set? - Thanks! I can't decide if I should lay my 3x6 back splash cantered or staggered? Any advice would be appreciated! Distance from countertop to pendants - Can you share the distance between the bottom of the pendants and the countertop? Beautiful kitchen! What is the thickness of the countertops? Linda McDougald Design 51. The stainless steel and gray leather-covered stools add just enough pizazz to this white kitchen.